The Dayton RS52AN is a rather unusual midrange driver. Instead of a cone, the diaphragm is a 2″ dome made of aluminum. As in all metal diaphragms, there is a severe breakup when it loses control. The plot below is the RAW response of the RS52AN. The breakup can be seen at about 12kHz. For best results, the cone breakup must be treated. Failing to do so will result in horrendous treble. Fig 1 – RAW Frequency Response of RS52AN. No smoothing. Impulse window=3.5ms. Measurements below 700Hz include room reflections. Fig 3 – 2nd (RED) and 3rd (VIOLET) Harmonic Distortion. The RS52AN harmonic distortion is -60dB below the fundamental. Measurement in Fig 3 is of the RS52AN with a bandpass filter with corner frequencies of 800Hz (HP) and 4kHz (LP) both at 12dB/oct. Fig 4 is the CSD of the RS52AN with a bandpass filter shown in Fig 3. Measurement is made with Rise Time = 0.1ms, Time Range = 1.0ms, Window = 1.5ms (667Hz) and Total Slices = 100. The CSD shows the RS52AN displaying minimal artifacts in it’s working range. To get acquainted with the RS52AN, I set up a 3-way active system. This is the fastest way to evaluate new drivers. The RS52AN and XT25SC90 tweeter are powered by AmpsLab’s Synergy LM3886 amplifiers. The built-in 18dB/oct crossover takes care of the mids and highs. 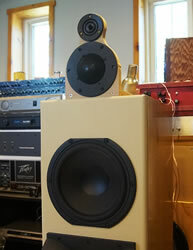 An external 24dB/oct electronic crossover handles the crossover of the RS52AN to a Peerless 830869 woofer. The power amplifier driving the woofer is the Bi240mk2. High Pass of the RS52 is at 800Hz (24dB/oct). Low Pass is by Synergy at 4,500Hz (18dB/oct). No passive or active EQ applied. The RS52 cone breakup peak at 12kHz is down 18dB. This will not interfere with the tweeter’s response. Fig 2 shows the RS52 Low Pass and XT25SC90 High Pass with the Synergy crossover set at 4,500Hz. The Blue plot is the summed response of the midrange and tweeter. The XT25SC90 is wired in Reversed Phase. The Blue plot in Fig 3 is the Peerless 830869 woofer with 800Hz (24dB/oct) Low Pass. The Black plot is the RS52 High Pass also at 800Hz (24dB/oct). (Fig 4) Summed Response (No Smoothing, mic at 1 meter XT25 axis, 5 msec gating). Disregard measurement below 500Hz. Fig 4 is the summed response of the 830869 woofer, the RS52AN midrange and the XT25SC90 tweeter. Disregard measurements below 500Hz. My room is interfering with the accuracy. The flatness is incredible. Apart from a small blip at 4.5kHz, it is virtually ruler straight all the way out to 10kHz. Bear in mind that No Smoothing was applied to the plot. Further to that, there was no EQ, whether actively or passively. Tweeter wired in Reversed Phase. The realism of the mids with the RS52AN is astounding. It’s not simply the clarity and transparency. It’s fast. The attack of the voices and instruments must be heard to believe. There’s also the micro details that adds depth to the mids. Most of the time, these get lost but not with the RS52AN. This speaker can best be described as revealing. It will show everything, good, bad and ugly. A fully passive version using the RS52AN is at Falcon-II. This page was last modified on 19 Feb, 2018.